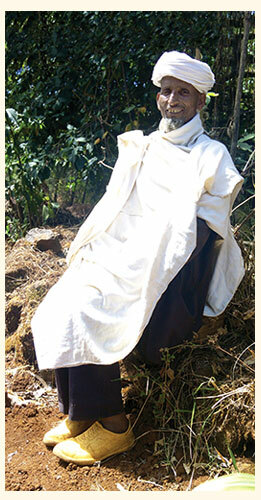 Father Tamiru lives in Gozamen District in Ethiopia, where the red clay soil is rich in silica. Chronic exposure to the soil from working barefoot in his fields triggered an inflammatory response called podoconiosis (podo) that caused swelling and disfigurement of his feet and lower legs. And because many Ethiopians, like Father Tamiru, rely on agriculture for their livelihood and go barefoot while farming, podo is all too prevalent in the country. Following his new regimen, Father Tamiru’s feet are now healthy, and he is back to farming. Using his role in the Church, he also teaches others in his community about the importance of good foot hygiene in preventing and treating podo, and incorporates these lessons in sermons and Church activities. Because of your support, since 2009, IOCC has been working in cooperation with the Ethiopian Orthodox Church, medical epidemiologist Dr. Gail Davey of Brighton and Sussex Medical School, TOMS, and health extension workers of the Ethiopian Ministry of Health in an effort to eradicate podo, which impacts an estimated three million people in Ethiopia alone. The program includes prevention activity (including the distribution of shoes to more than 80,000 people annually), treatment of podo patients, and education to raise awareness of the condition’s causes and to dispel the stigma surrounding it.